Thus, a large majority of those, who voted, consider themselves to be moderate doubters or even deniers. New vote. A new vote has been prepared, but it will need some time to have it up and running (because of unrelated work taking precedence). We may have to do this new vote via doodle - or does somebody knows how to run a more complex votes on blogspot? In the last weeks, we have changed the counting of visitors - from klicks ot "new" visitors. A visitor is "new", when his/her last klick was done more than 1 hour ago. Issues to be discussed: I noticed that we have to discuss the issue of mathematics, of "the" equations, which simply do not exist. Navier-Stokes is part of the story, but only part, maybe the simpler part. Also the question whether climate is an issue of long averages should be deepened a bit. the prices of the books are apart from each other by a factor of more than 3 (Amazon quotes 123 EUR for the newer vs. 38.95 EUR for the older one). 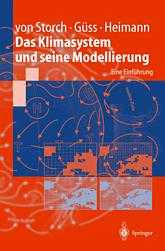 Can you recommend the German book for our purposes or have so many modeling details changed between 1999 and 2004, that the new book is a must-read as an introduction? the 1999 book does not contain results of the past 10 years, true, but the basics are really unchanged. 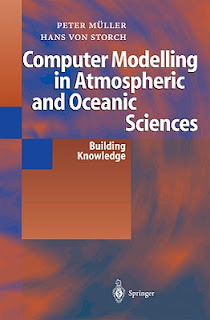 we wrote it as an introduction for intelligent, well-educated people (for instance with a diploma in a natural science discipline), who may be interested in applying climate model data in their own research; or who would like to understand the context better. Maybe, you find the books in your library?